The pope and 82 members of the Roman Curia, who left the Vatican by bus March 9 to travel the 20 miles to the Pauline Fathers’ retreat and conference center in Ariccia, returned to the Vatican by bus March 14. 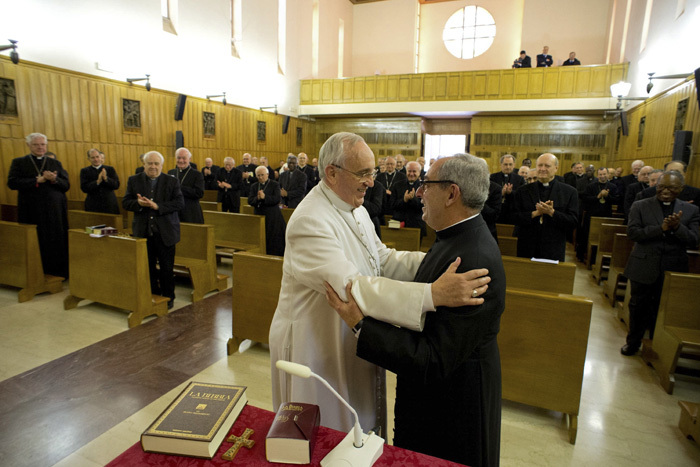 Before they left the retreat house, Pope Francis thanked Msgr. Angelo De Donatis, the pastor of St. Mark’s parish in the center of Rome, whom he had chosen to guide the Lenten retreat. While the meditations were not made public, the Vatican newspaper offered brief reports on their content. According to L’Osservatore Romano, Msgr. De Donatis began the final reflections March 13 talking about how no one could understand the value of God’s love using economics or commerce, which too often are the only way modern people determine the value of anything. He told the story of a little boy in a first Communion class in his parish who asked him, “Do you know Jesus so well through your work or are you friends?” Msgr. De Donatis told the pope and Curia officials that the only way to truly know Jesus is through friendship and love.